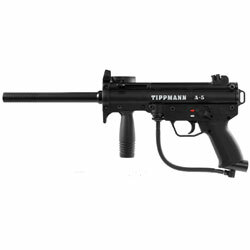 The Tippmann A5 paintball marker is one of the few paintball markers that truly deserves its cult status. Reliability, ease of maintenance and a near endless choice of accessories and upgrades have made it the choice of hundreds of thousands of players worldwide. It introduced the Cyclone Feed System, which uses excess pressure from the valve to power the loader, agitating and forcefeeding the paintballs with each individual shot as fast as you can pull the trigger. 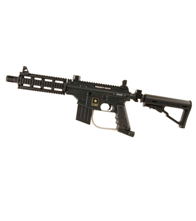 Its pull pin design allows major field-stripping without tools for simple hassle-free maintenance and its external design gives the player an unprecedented number of tactical upgrades and accessory paths. - New Tombstone Connections makes maintenance faster and easier with less parts. The Response Trigger features a piston mounted behind the trigger that kicks the trigger back with more speed and force, letting you 'bounce' the trigger for a full auto firing rate without batteries.